Prior our short “overview” let’s explain the setting. 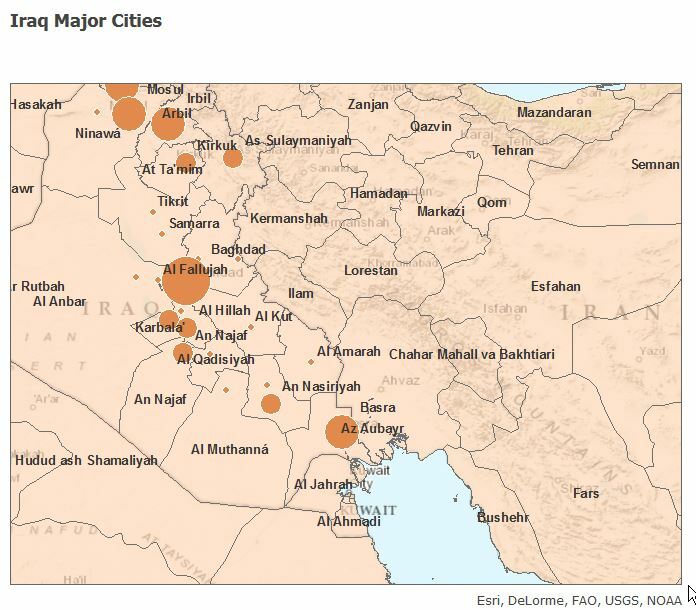 We aim to create a map of provinces and cities in Iraq. We would like to have cities represented in size of population and the provinces and cities should have labels as well. The “crucial” part: We only have a csv file with city names and attributes (incl. coordinates) and a kmz from Google Earth where we “digitized” provinces. The geo-aware people will probably download the same data from Natural Earth Data as shapefiles but a csv file and the work with Google Earth resulting in a kmz/kml file is quite common in the non-GIS world. We will try to export the map as an image and try to embed into our blog post as an interactive map. As some mappers don’t have coordinates we will check geocoding possibilities as well. Attention: This is not a professional, in-depth analysis of current webmapping platforms. Many of the “analyzed” platforms have much more functionality as we need. We don’t care if we cover everything and it is just our personal opinion. After registration with an email address I was asked to create an account and an organization. Unfortunately ArcGIS.com does not tell you to use only letters and numbers in passwords (is this 1998????) so it took me a while to register for my 60 day trial period. After this it went quite smooth: Pressed “New Map”, click on “add+”, choose my csv file and 1-2-3 I got my map with a selectable basemap, my cities with labels and population-proportional circles (easy due to interaction menu on the layer in content and “change style”; sidenote: Fancy heatmaps are available to!). But now comes the tricky part: sharing it on an own website. First I needed to check my layers and maps to be sharable with “everyone”. This was not straightforward especially not for the layer. 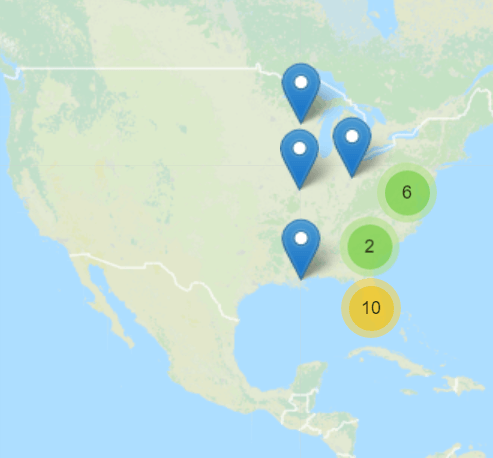 After choosing “Share” I was presented with an iframe code to embed (see the map below) but I haven’t managed to see my cities right away. It seemed like it took about 20min to migrate the added layer into the databases of our friends at Redland. Only the basemap was presented first hand. Now you can see the city file below as well. 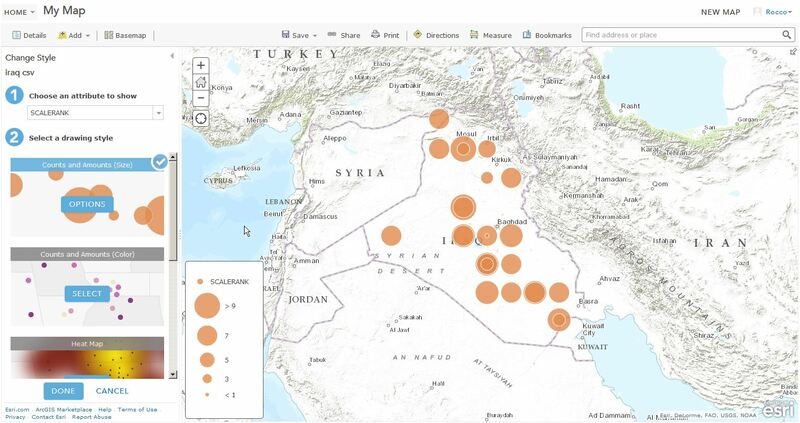 Additionally ArcGIS online does not support kmz files out of the box (see comments below) and I haven’t found any data especially for Iraq. Wait! You said trial account? ArcGIS online requires a subscription plan. It is not easy to see a price tag for this but you can do the math: license is 500$ per year per user for a minimum of five users. The best thing on cartodb? It’s free for the basic usage. The first level of plans with private data tables starts at about 150€. Compared to ArcGIS online the pricing scheme looks quite transparent. Unfortunately it’s not straightforward to add labels. Mapbox was also a little game changer as they opened the world for non-GIS people, designers and web developers. With their Tilemill studio it is easy to create your own basemap backgrounds and tiles. But what about the basic stuff? The registration was off course quite easy. But now the trouble starts. First: add the csv file as data failed miserably. I was not able to import my data straight away. After a while I figured out to use “,” as the separator after trying to alter field names, decimal separator, the order of the fields and so on. After I managed it I just needed to select the title and the description (not more than one field allowed :-/ ) The import of the kmz was not supported so I needed to extract the kmz to a kml and add it. Furthermore there are no labels adjustable and also the popup was only customizable on a feature basis. The CSV was treated not as a layer. Instead every entry in my csv was imported as a separate feature. that was not very easy to customize as you needed to design the popup for every city :-(. If you want to add a csv file as part of a data storage you need a basic plan which means a subscription at a basis of 5$ per month. That said I found the possibilities which you can use in the online editor quite limited. I am aware of their great API and developments like turf and also some great basemap designs. Additionally you can colorize your regions of interest interactively. Unfortunately you can’t upload regions/polygons. There is no possibility to embed a webmap. But the allow you to download the data as kml/GeoJSON or as image with customizable parameters like width and height of the image or to show/not to show the legend. “Make a map – it’s free” – I followed that slogan in order to map our sample data with mango maps. First you have to do a fast sign up process on Mango Maps and the mapping starts immediately. Mango Maps offers four levels of map customization: 1. Customize the theme and layout of your map 2. Upload data and create visualizations 3. Enhance your map with additional tools 4. 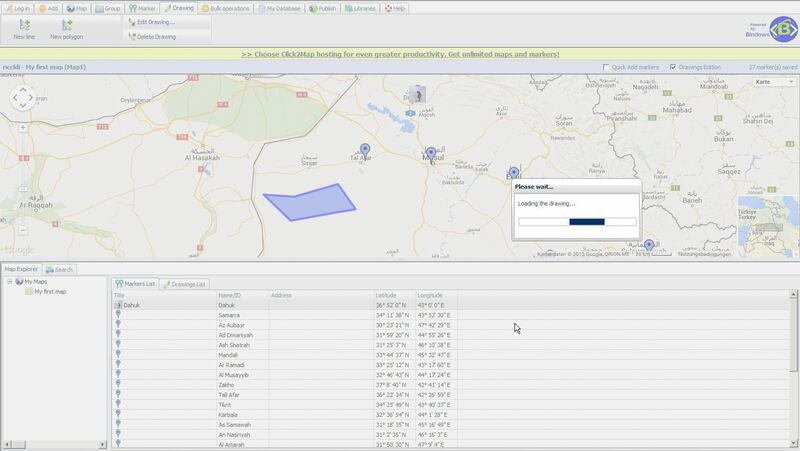 Decide who has access Luckily Mango Maps offers all common data formats for uploading map data (Shapefile, KML, File GeoDatabase, GeoTIFF, CSV, GeoJSON, MapINFO, WMS) so the upload of our csv iraq-data worked without any problems. The KML must be saved as KMZ. Some great styling menus later, I get a publish-Link with inline-options, social sharing and some other features. All in all is mango maps really useful and easy to use. If you want to host your map, it’s 39$ per month or 390$ per year. What is your preferred online solution for easy webmaps? Give us a quote. If you have trouble with creating a webmap for your needs, just contact us for professional support.